The girls faced off against the Oxford Ladies. There was a great atmosphere within the whole team and it was great to watch them carry on with such great team work and smart playing. Even though Oxford put up a great fight, Portsmouth stood out as the superior team and ended up winning 3-­0. Nikki New was on form and her powerful attacking and reliable presence got her voted as the game’s MVP. The ladies of Portsmouth showed great team work and smart playing against the team of Plymouth. 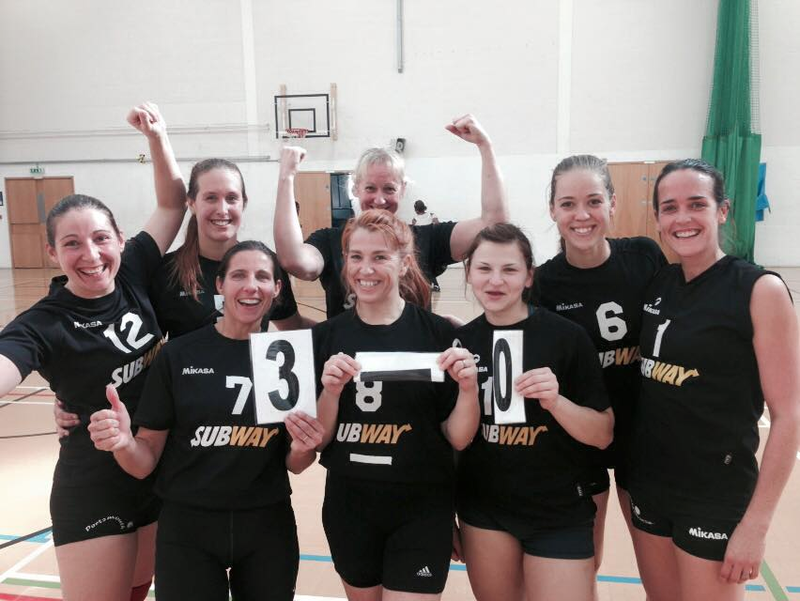 After losing the first set, they managed to come out as the stronger team and won the game by 3­-1. Nicole Sparks was a great asset for the team for her cleverness and ability to read the game and won MVP. Tracey Cleeve stood out for her smart attacking and leadership and won MVP for Portsmouth. It was another great game to watch at Priory School, between Portsmouth Volleyball Club and Richmond Volleyball. The Portsmouth team started up with Amanda Yanlai, Nikki New, Elise Krick, Kathy Green, Nicole Sparks and Tanya Mason. We saw the team get back to their form, where it was obvious they were having a great time and demonstrating great team work. After winning the first two sets, Richmond managed to steal one set from the girls before the game ended at 3-1. Nikki New truly shone in the game with her powerful attacking and strong serving. She was voted Portsmouth’s MVP. The Portsmouth Ladies travelled to Basildon to play against Essex Trinity. Portsmouth initial line up consisted of Erica Santos, Nicole Sparks, Tanya Mason, Pamela Barrachini, Tracey Cleeve and Elise Krick. Although they started off really well by winning the first two sets, Essex managed to recover from the disadvantage and steal the game 3-2. It was another hardworking, exciting game and both teams put in huge effort. Nicole Sparks stood out for her energy, resilience and well thought attacking and was voted by the Trinity Ladies MVP for Portsmouth. In the 4th game of the season, we saw the Portsmouth girls battle it out until the very end against Bristol. Portsmouth, coached by Kathy Green, started with the same line up as all previous games (Erica Santos, Nikki New, Tanya Mason, Nicole Sparks, Tracey Cleeve (captain) and Elise Krick. There was, again, a lot of strategic attacking from the girls and this proved very effective, paired with a good understanding of short attacks defence. The girls were ahead after the second set by 2-0. However, Bristol, who had been giving Portsmouth quite a great fight, turned it around by taking it to the fifth set and winning. It was a very intense game where you could see there was genuine enjoyment and great ambience. Nikki New was voted MVP once again, after performing greatly through 4, knowing when to attack and when to tip effectively. The third game of the season was against the Reading Aces and there was a great atmosphere. The Ladies of Portsmouth started with the same line up as the previous games (Erica Santos, Nikki New, Tannya Mason, Nicole Sparks, Tracey Cleeve (captain) and Elise Krick. Both teams demonstrated great sportsmanship and showed that they really do enjoy playing volleyball. It was a very fluid and fast paced game and the girls showed how hard they’ve been working on strategic attack and covering defence just behind the block. In the end, Elise Krick’s smart and sometimes powerful attacks through middle got her the tile of Portsmouth’s team MVP. On Sunday the 27th of September the ladies of Portsmouth Volleyball Club made their way into Tooting to play their first game of the season! Kathy Green led and coached the team and there was a great ambience as the initial six (Elise Krik, Erica Santos, Nicky New, Tanya Mason, Nicole Sparks and Tracey Cleeve) stepped on court to face the Dulwich Tuskers volleyball team. the girls were enusiastic and energetic. After three sets of a lot of great team work and simple and effective playing, they came out victorious 3-0. Tanya Mason was voted Portsmouth’s MVP, having stood out for her strategic and powerful serving. great work ladies, well done! The ladies of Portsmouth Volleyball Club welcomed Cambridge Volleyball at the Mountbatten Centre for the second game of the season. Elise Krick, Erica Santos, Nicky New, Tanya Mason, Nicole Sparks and Tracey Cleeve were again the initial six that took part on a very exciting and close game. After battling out for every single point, the girls defeated Cambridge by 3-1. Nicky New’s clever and effective attacking got her the MVP title this time. Another great game for the ladies, great team effort and hard work! well done!